Stag and Dagger returns to Glasgow next Sunday! ELECTRIC FIELDS IS MOVING SITE FOR 2019Stag and Dagger returns to Glasgow next Sunday! Stag & Dagger, Scotland’s original multi-venue event and biggest new music showcase, is back this May 5th. 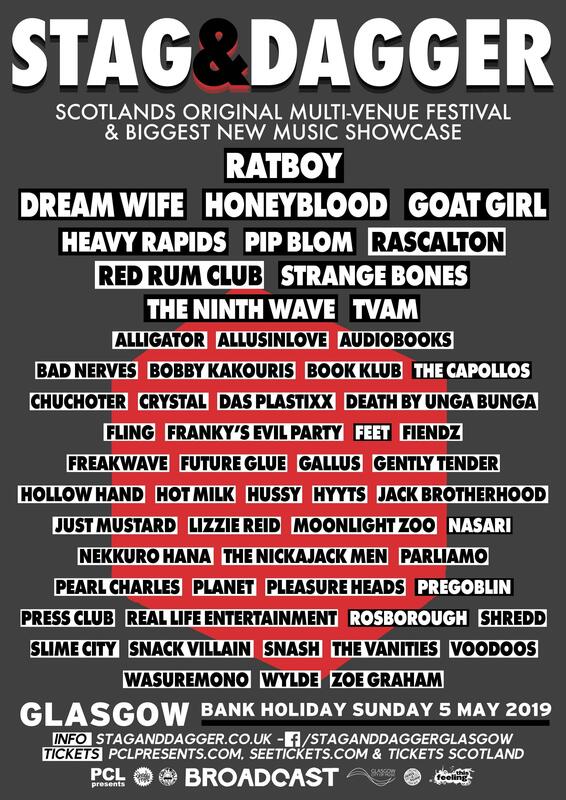 Always sourcing the hottest new talent around, Stag & Dagger returns on May Day Bank Holiday weekend with Rat Boy, Dream Wife, Honeyblood, Goat Girl, The Ninth Wave, Pip Blom, Rascalton, Rosborough, Pregoblin, and more set to play alongside a cast of over 50 acts. Running from 2pm until 3am, your ticket gets you a wristband and access to see over 50 of the best up and coming artists around today as well as more established names. Set in central Glasgow, it really could not be easier to jump between gigs and with Ed Sheeran, Royal Blood, Warpaint, Mac Demarco, Courtney Barnett, Wild Beasts, The Twilight Sad, Glasvegas, Lizzo, Frightened Rabbit, Lizzo, Jungle, Fat White Family and many others having played Stag & Dagger in previous years, there is a good chance that you will be watching a stadium filler of tomorrow. Today Electric Fields has announced that the festival is moving site for 2019. The festival will return for its 7th edition across 25 - 26 May Bank Holiday weekend to provide another unmissable weekend of world class electronic music. BoConcept event: "If you could invite any six musicians to dinner, who would you invite?" Following two instantly sold out shows at Londons Moth Club last year, WHITE DENIM return in 2019 for a European tour in February which includes a show at Londons Roundhouse. On 8th February, Classic Grand will be hosting a range of bands featuring Esperanza, DF118s, Hango Munks, Anna Secret Poet and Pink Trauma.